If I’m honest, I’ve always kind of envied those of you with dramatic conversion stories. You know… the ones with drama and suspense. The ones where you hit rock bottom and find Jesus there. As a little girl, I remember hearing these stories most. They are the stories that always seemed to make the best videos, draw the biggest crowds, elicit the most enthusiastic celebration. My story is not like this. I was the little girl preaching to my stuffed animals at two years old. Reading the Bible through in elementary school (and no “easy reader” version either—thank you very much). Earning gold stars for Sunday School attendance. Scripture verse memorization. You name it. I was the little girl voicing my concern about the lyrics of Amazing Grace because I wasn’t sure I was really a wretch. So when I read Luke 15, I have no trouble identifying with the older son. I am no stranger to his judgment and cynicism. Today, though, it is not the older son that commands my attention. He catches sight of his younger son—the one who will have the dramatic conversion story, and he takes the initiative. He runs to greet him. He invites him in. Then the Father hears whispers that his other son—the one with gold stars for Sunday School attendance is outside, and again he takes the initiative. He leaves the party and catches this son’s eyes, trying to reason with him. He invites him in. No matter where our life circumstances may take us, our Father takes the initiative. He runs to greet us, catches our eyes. He invites us in. The miracle is the same. It takes just as much Jesus to rescue a church baby who doesn’t know she’s a wretch as it does to rescue a prodigal who has hit rock bottom. I am a little overwhelmed at the response to my last post. Thanks for reading. And sharing. And praying. I am still a mess, but I know one thing with one hundred percent certainty. And these past few days, I have heard these words again and again. The truth is, I am a pretty private person. I don’t trust easily. I don’t share easily. Writing about thoughts is easy for me. Writing about feelings is hard. Vulnerable. I second-guessed myself a thousand times as I wrote about my sadness, my loss. I know this sadness. This loss. These words could be mine. Foster mamas who have walked this road. And all kinds of other folks who know what it means to feel the ache of the fall and the draw of redemption. Friends who know what it is to be hurting and hopeful, broken and held. Our enemy wants us to think that we are alone. That no one could possibly understand. That we are the only ones to ever walk this road. Have these doubts. Wrestle with these questions. And so we shut our mouths, shut our doors and imagine that everyone else is just fine. You want to punch someone in the throat when they shrug their shoulders and tell you to “just” trust God’s sovereignty? Me too. You are tired of picking up the pieces, of loving with no guarantee, of pouring your heart and soul into a story whose end you may never know? Me too. You wake up panicked in the middle of the night, scared that you have been wrong all along? Me too. Speak the thing that feels too dark. Too heavy. Not “Christian” enough. Because today, friends, I know one thing with one hundred percent certainty. So, how are you really doing? Today my foster baby left my home. This is the goal of foster care. And the reason that most people who consider becoming foster parents decide not to do it. So many of you have stepped in and asked me how I am doing, and I am grateful for every single one of you—even if I cannot bare my soul at the exact moment that you ask. The truth is, this is hard. Today, I am not ok. I will be ok again. And that is good enough. Today, no matter how hard I try, I cannot be the strong one. I will be strong again. Stronger, maybe. In the meantime, I will be honest. Today, I can only cry (and cry and cry). Another day I will think and write about the gift of loving this little one. Today, I cannot pray with words. I have rallied the troops, the ones who have words when I do not. They have whispered those words into my ears, written them down for me to read later, and spoken them in secret to the One who hears. Today, I cannot bear to hold your baby (sorry!) or fawn over the picture of your swollen belly (sorry!) or even “like” your clever online pregnancy announcement (sorry!). I will be happy for you. One day soon, I will hold and fawn and like. I will. Today, I stomp my feet and shout that I am done. Done with the uncertainty. Done with the heartache. Done with this whole business of mothering into another mama’s arms. I know that this may well be true. Or it might not. Today, I am hurting and hopeful. I am broken and held. I know that I have loved well. I know that I am loved well. And, today, friends, that is good enough. I grew up knowing the truth about Jesus. I was a church baby… my daddy was a pastor, for goodness sake! I was a serious child, so when I made a personal profession of faith around the age of 7, it was after all of the thoughtful consideration a child can reasonably be expected to make. It was real. I loved Jesus, and I knew I needed him to take away my sin and help me live fully in this life and make it into heaven in the next. Fast forward to my sophomore year of high school and my life was falling apart in the way only adolescent lives can. My safe place, the church, had become a place of hurt and isolation. My teenage emotions had been manipulated. People who had told me for years that they loved me and my family were dropping out of our lives. And I was mad. Church was supposed to be different. Christians were supposed to be different. How dare they hurt me like this? I was foolish to believe them all along, to let them get close. Months passed and I let myself sink further and further into my anger and isolation. I locked myself in my bedroom, writing furiously, vowing never to let myself get close enough to be hurt by Christians again. During this year, anger gradually took the place of church in my life. Anger became my default, my safe place. Anger felt good, it felt right, it took over. And then I had another encounter with Jesus. I can’t say it was an audible voice, but I heard it just as surely as I’ve ever heard anything in my life. Yes, you’ve been hurt. But you’ve got to make a choice. Now. Stop threatening and walk away. Quit this Christianity thing once and for all. Or run to me. Let me set you free from the anger. Let me set you free to abundant life. Knees on my bedroom floor, face buried in my hands, I knew my answer instantly. Lord, you have the words of life. Where else can I go? I wish this was the end of the story. The truth is that, because they are sinful, broken people (just like me), the ones who were supposed to be safe, who were supposed to be different, would let me down again. My anger came back with a vengeance. This time the anger was easier. It felt safe. I knew how to do angry. But this time I knew the eventuality too. I knew that I couldn’t walk away. I knew that though the chains of anger were familiar, they were also heavy. And I knew that I couldn’t break them alone. This anger was powerful. I couldn’t wish it away or reason it away or work it away. Run to me, Jesus was saying again. Let me set you free from the anger. Let me set you free to abundant life. Back to my knees I went, and again I met Jesus as my deliverer. I love the truth that Jesus made me new once and for all when I confessed him as a child. But he is also making me new every day as I choose to live in his freedom. Freedom from the anger that still crashes into my life with one word or thought or memory. Freedom into relationship and vulnerability and trust and grace. Abundant, extravagant grace. Enough grace for the past. Enough grace for the ones who claim Jesus but don’t always live like him. Enough grace to confront my criticism and judgment. Enough grace, after all, for me. She sits on the dusty ground, her strong fingers separating tiny grains of rice from pebbles and bits of trash. She is scanning the horizon and her face lights with joy when her little girl appears in the distance. Her little girl, all arms and legs and beautiful heart trailed by us—a couple of blan on mission for Jesus. Come, come she invites, and we join her on the dusty ground. We are welcome here and yet so tentative, so unsure of ourselves (I am, at least). And so we reach into our overstuffed bags and pull out a few gifts. It’s nothing much, we say. A bracelet, a sheet of stickers and (most treasured) the photo of a smiling family. A family that knows her daughter’s name. A family that sends their love all these miles in the overstuffed bags of the blan. Wait, she says. I have something for you too. No, no, no we protest. Blowing bubbles with your little girl is enough. A son is dispatched. A tree is scaled. A machete is wielded. And we blan walk back to join our team with arms full of coconuts. We struggle to open them (where is that son with the machete when we need him? ), then drink in their euphoric sweetness. The sweetness of beautiful Haitian coconuts. The sweetness of being welcome here. The sweetness of a gift reciprocated, of human dignity acknowledged. It is a gift forever wrapped up in the heart of this blan. A gift that evokes strong emotion these years and years later. A gift that I pray I will never forget, and might one day have the opportunity to reciprocate. The sweet gift of absolute, honest generosity. 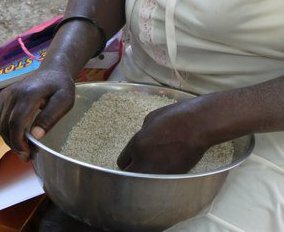 In 2011, I visited Haiti with Food for the Hungry. If you want to learn more about what they do (or sponsor a child), you can check them out here. What do we value in people? What they can do for us? In Luke 15, a group of tax collectors and sinners gather around Jesus. They are men and women not esteemed, not valued in their society. Different from the Pharisees, the teachers of the law. Different from the ones looking down their noses, calculating value. He tells them a story. A woman has ten coins, and loses one. She still has nine. Surely nine is plenty. How much value does that one measly coin have anyway? The lamp is lit. The house is swept. The search is made. The neighbors are called. The rejoicing is loud. Are we the Pharisees, the teachers of the law? Are we the ones looking down our noses, calculating value? Do we allow a few measly coins to stay ignored and forgotten? Or are we lighting lamps and sweeping edges, searching high and low for ones who are valuable simply because they bear the image of God? Simply because they are human.